I have been bored by thin crust pizza. There, I admitted it. I have found pizza's deeper dish brother to be far more exciting as of late. Deep dish pizza has so much more flavor, depth, and fulfillment...but also so many more calories. I craved a hot piece of pizza the other night, but I knew the right thing to do was to placate myself less sinfully with thin crust. I hedged my bets on a new pizza place in Park Ridge called Paninos. I ordered a 16 inch thin crust of half mushroom and half sausage for $20. This pizza was meant to feed 3 people, so if paying only $20 would enable me to do that, I felt A-OK with that. It took about an hour to arrive. We dove in. The toppings were fresh and flavorful, the cheese was gooey and ah-mazing, the sauce was nothing to sneer at, and the crust was crispy and tasty. I really enjoyed the pizza, but if I were to dig deeper as to why, I guess I would have to say it was the cheese and sauce combination. For me, I love tasting gooey, slightly salty, aromatic cheese, and I don't mind if I don't notice the taste of the sauce--as long as the cheese is that good. The cheese was that good. That's not the say the layer of sauce wasn't thick nor pleasant enough, but the combination was a pleasant one. Located on 28 S. Fairview (I believe where the Rosario's pizza once was), Panino's is a fresh find. The restaurant also looks kind of cute. 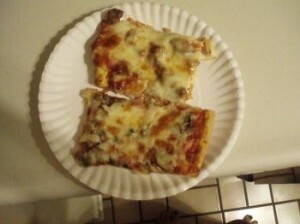 Check out more at www.paninospizzeria.com. Panino's Pizza gets 5 out of 8 slices.